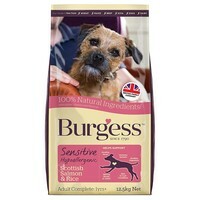 Burgess Sensitive Adult Dog Food (Salmon & Rice) is perfect for dogs with a sensitive digestion system. Made from only a few simple, high quality ingredients such as tasty Scottish Salmon and Rice, the recipe is free from all the usual ingredients that can upset your dog's stomach and will help them to maintain a healthy skin and coat. Furthermore, Beet Pulp has been used to aid healthy digestion and a smaller kibble size means that it is ideal for any size dog.